What is the Order of Nova Scotia? 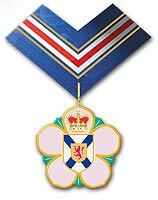 The Order of Nova Scotia is the highest honour of the Province of Nova Scotia. Established in 2001, it encourages excellence by recognizing Nova Scotians for outstanding contributions or achievements. Members of the Order of Nova Scotia have distinguished themselves in many fields of endeavour and have brought honour and prestige to themselves and to Nova Scotia. Any Canadian citizen who is a present or former long-term resident of Nova Scotia is eligible for nomination to the Order. The only exceptions are public officials (such as members of the Senate, MPs, MLAs, municipal councillors, or judges), who may not be nominated while they are in office. The Order may be awarded posthumously, if the person is nominated within one year of their death. Only individuals may be nominated, not couples, groups, or organizations. Simply click here to download a PDF version of the nomination form and guidelines (Requires Adobe Reader version 5 or later; see note below*), Or contact our office and we will send you a copy. Then fill in the form and send it to the Province of Nova Scotia Protocol Office, along with information supporting your nomination. A checklist on the back of the form outlines what is required. You must ask at least three other people to write letters supporting your nomination; however, only one form is required for each person nominated. If you know someone who has made an outstanding contribution to the cultural life or the social or economic well-being of the province, you should consider nominating him or her for the Order of Nova Scotia. It is a special way to honour an individual you respect and admire. Fields of endeavour recognized by this honour include the arts, academics, research, agriculture, business, industry, community leadership, public service, and volunteer service. Nominations are accepted throughout the year. The deadline for consideration is the third Friday of March. An independent group called the Order of Nova Scotia Advisory Council recommends the appointment of members to the Order each year after considering all nominations received. There are no fixed quotas or categories, but a maximum number of six appointments will be made each year. If a sixth recipient is chosen, that recipient must be between the age of 16-25 years. At a formal ceremony, the Lieutenant Governor of Nova Scotia, in the name of the Crown, presents each recipient with a medal in the form of a stylized mayflower, the provincial floral emblem, bearing the shield of arms of Nova Scotia surmounted by the crown. The medal is worn with a blue, white, red, and gold ribbon-the colours of our provincial flag. There is also a semi-formal medal and ribbon and a lapel pin. Members of the Order are entitled to use the initials O.N.S. after their names. *You will need the free Acrobat reader to view this file. The free reader is available on the Adobe site.